Art should be shared. At least, that's the belief of mixed-media artist Dina Wakley. Through the creative act of Art Journaling, she tries to find and help others find that spark of creativity within them. 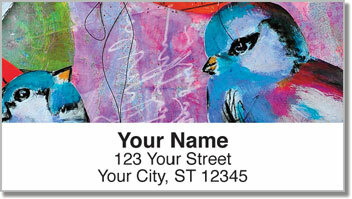 You're sure to see the fruits of her labels on these striking address labels. not only do they use a breathtaking color palette, the mixed media elements make them truly 3D like these birds will pop off the page at any second. 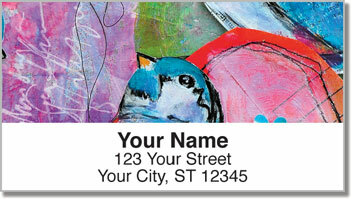 With self-adhesive backings, it's easier than ever to peel and place these labels exactly where you need them. 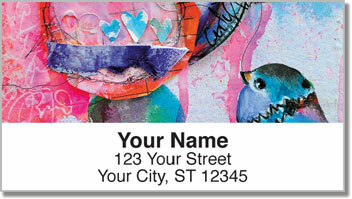 You're sure to show everyone a personal and artistic side with every letter you send. Unlock your inner creativity. 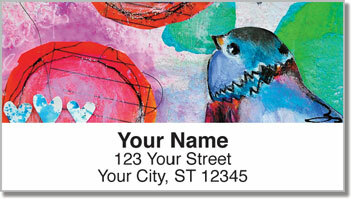 Order these Birdie Address Labels today.